Modern Touches’ Lucas Herrick named to 40 Under 40 for 2016. Each year, Professional Remodeler magazine names its “40 Under 40,” recognizing young professionals in the residential construction industry who stand out from the crowd. After a nominating process late in 2015, the review committee evaluated thousands of applications, narrowing the field to a final, elite few. Unlike other awards and ‘best of” lists, the 40 Under 40 recognizes individuals, not the businesses, and it seeks to honor those up-and-coming professionals in the home construction fields who are changing the way their companies do business. Lucas Herrick, the owner of Modern Touches in Urbandale, was included in the recently published 2016 list of talented young people. And he didn’t even apply. The application process for the 40 Under 40 award began late last fall. Early in 2016 the finalists were contacted and interviewed by Professional Builder representatives. That’s when Herrick found out about the nomination. “I first heard about it a few months ago, when they contacted me to tell me I’d made the cut for the final evaluations. I was surprised and humbled and proud that we’d made it that far. 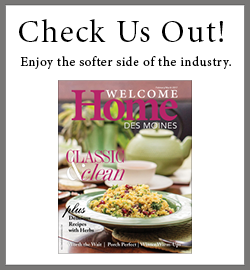 With 3,500 licensed remodelers in Iowa alone, just making it that far is a big deal. I didn’t expect to make the top 40 in the U.S.,” he says. This year’s focus, in addition to overall excellence, was on “best practices”—unique ways that these individuals have changed the way their companies serve their clients. Herrick met the criteria because he did more than change the way Modern Touches does business. He created a separate business to meet an unfilled need. Some remodelers specialize in providing contractor services—overseeing a project and ensuring that subcontractors achieve the desired results. Some remodelers focus on performing the remodeling work themselves; they have skilled craftsmen and trades on staff who do the hands-on work. Few do everything, from concept to design to actual completion. Modern Touches started offering that service to clients, using various software programs to develop floor plans, drawings, and 3-D design layouts. “We realized that this was a unique service, and we started talking about whether that was something we could market as a separate service in addition to our remodeling business,” Herrick says. With a dedicated full-time staff that includes an architectural designer, an interior designer, and a construction manager with more than 25 years of experience, the Modern Touches team decided to expand the business—by opening a new one. And in 2015 Remodeling Design was born. Herrick’s team now includes three qualified designers, as well as construction supervisors and longtime partnerships with subcontractors who share his vision and ethic. And they’re already developing more ways to expand the design side. Building on his childhood training and his military background, Herrick has surrounded himself with a team of like-minded professionals who want to give their clients a different experience than they might have come to expect. Like all of the best leaders, Herrick gives the recognition to his team. He may have been surprised by the honor when Professional Remodeler contacted him, but no one else was.